On my Twitter account, I often post photos of my writing process, or my home office, or my campus office, and sometimes fellow scholars make remarks on whether my actions make sense or are helpful to them. In response to one of them, I made a joke on Twitter that people might not be interested in knowing why I organize journal articles, book chapters and so on the way I do, and then I was told that some people might, so here is my rationale and process. First of all, I am a bit of an obsessive compulsive organizer. I always like having everything sorted out, and accessible. That’s how my brain works. So from a very early age (when I was in junior high), I decided to organize my notes and books in such a way that it would be super easy for me to find them, read them, etc. 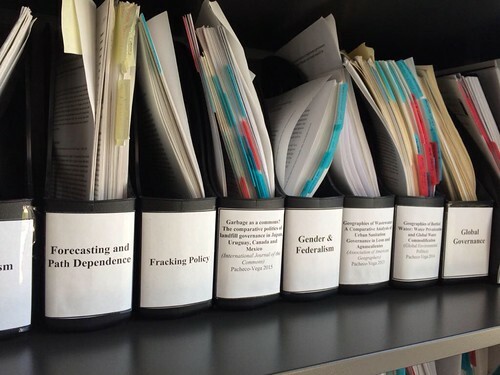 1) I sort all the published material I own about a topic (journal articles, conference papers, book chapters, photocopies of materials) by topic. I also sort them out by manuscript I’m writing. So for example I am writing on the global politics of sanitation. I have a magazine holder with articles and book chapters specific for that paper, but I also make sure that I organize all published materials for a specific topic. This sometimes results in repetition because manuscripts will use papers from across disciplines or topics, but I don’t usually mind because normally I sort by paper I am writing rather than by research topic. What ends up happening is that once I create a magazine holder for a specific paper and I start drawing papers from other holders and moving it to the manuscript’s rack, some of them may run empty. 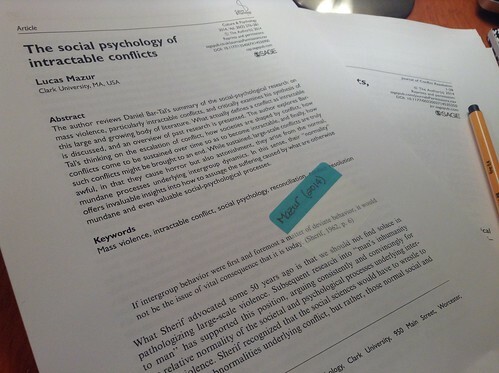 2) For each article, I organize it as follows: I use a plastic Post-It tab (2 inches, usually) to separate each article. I locate it at the top right, or middle, or bottom, so that I can read them when I see the magazine holder sideways. I write the last name of the author (in Harvard style) and year of publication. 3) Finally, I sort all magazine holders by alphabetical order in each one of the labels. So, the first one at the top of my bookshelf is usually A and the last one is Z.
I know this may be considered a bit too obsessive-compulsive, but this is how I organize my articles, book chapters and everything that is input for my research. 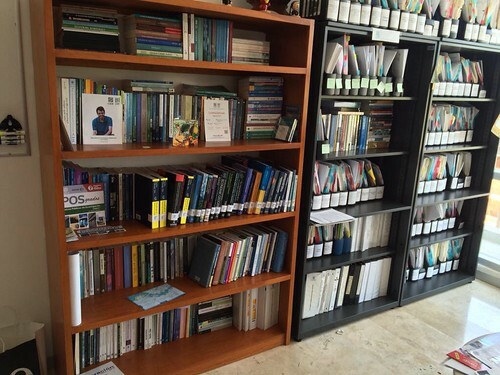 I follow a similar model by organizing my books by topic (e.g. water, urban development, regional development, public policy theory, global environmental politics).